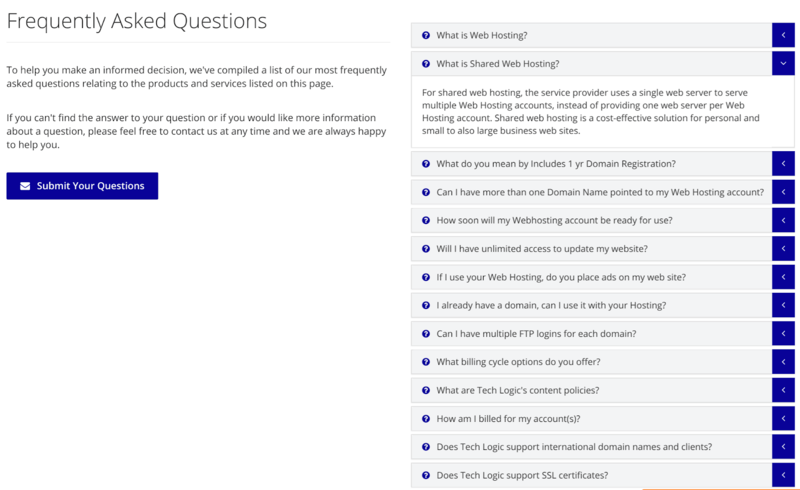 Tech Logic Solutions Review 2019: Is Tech Logic Solutions a Good Hosting? Tech Logic Solutions is a premier web hosting provider with offices located in Ontario, Canada. Since 2012 they have provided a full range of website hosting solutions along with SSL certificates, domain names, a website builder, website development, and search engine optimization. Tech Logic Solutions is a Canadian company with offices in Ontario. Established in 2012, this internet services provider offers an array of hosting services that include shared web hosting, cloud hosting, VPS, dedicated servers, and reseller hosting. All servers use SSD storage with LiteSpeed technology for fast and reliable performance. What’s more, this vendor continues to invest in hosting infrastructure so that it’s easy for clients to scale up their packages as their businesses grow. All Tech Logic Solutions’ plans include DDoS protection and daily automated snapshot backups. These backups can easily be retrieved following a data loss event, and customers can also generate their own manual backups through the vendor’s cPanel control panel. This provider’s web hosting solutions give you access to accurate website analytics, advanced SEO tools, and the Softaculous one-click auto-installer that lets you install and manage more than 300 popular scripts for WordPress, Joomla, Drupal, phpBB and other popular programs. They also provide the most popular and easy-to-use cPanel and WHM control panels plus a drag-and-drop website builder with hundreds of templates. For e-commerce websites, you can give your customers confidence thanks to the offered SSL certificates (extra cost) and SiteLock solutions (for websites of up to 2500 pages). Given the features they include with their packages, it’s easy to see why Tech Logic Solutions has become such a popular choice for many entrepreneurs in Canada and elsewhere. They offer some of the cheapest hosting plans in the Canadian hosting market. Their straightforward, monthly billing cycle with no hidden costs endears them to customers who value transparency and who would rather not commit to long-term contracts. Furthermore, Tech Logic Solutions has a 99.9% network uptime guarantee and offers a 30-day test period within which you can get a full refund if you’re not entirely happy. The Tech Logic Solutions well-trained technical support team is dedicated to helping your business succeed. You can reach out to them 24/7/365 via email, telephone, live chat, or by opening a ticket. Not only are they very experienced, but they are also polite and go out of their way to offer practical solutions to hosting issues. If you prefer to support yourself, you will find a detailed knowledge base and an attractive FAQ page. This Canadian hosting company has been enjoying steady growth since it began its operations just over five years ago. They have designed their solutions to accommodate everything from simple websites and personal blogs all the way up to more complex e-commerce websites with big databases. Their feature-rich hosting plans and excellent support continue to attract many new customers to this relatively new hosting company. Wondering how Tech Logic Solutions stacks up against other Web Hosting companies? Enter any other Web Hosting company and we will give you a side-by-side comparison.